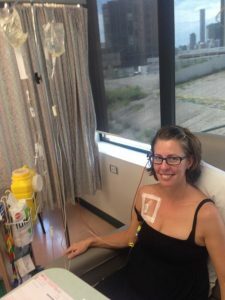 On Christmas Eve 2014, after a few days of indigestion and appendix pains, Renee found herself in emergency recovering from an appendectomy. When the doctor walked into the room with the surgery’s results, she and her husband knew immediately from the look on his face that the news was going to be hard to bear. Renee’s surgeon told her that she had a very rare cancer in her appendix. She was to go home for Christmas Eve and come back into hospital on Christmas day. This was not the family Christmas she had planned for her children, who were aged four, six and eight years at the time. This whirlwind of events meant that not only was Renee away from her family for Christmas but the year ahead—2015—suddenly seemed uncertain, scary and out of her control. 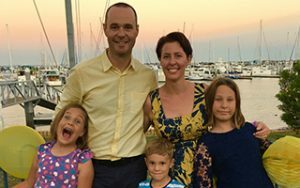 At the time, Renee’s worries were mostly focused on her family and kids and what her diagnosis would mean for them. She was supplied a single pamphlet by the hospital that told her how to break the news with an initial conversation to her children, but nothing more. Thank goodness Renee got in touch with Mummy’s Wish. On her third round of chemo, Kylie, a Mummy’s Wish co-ordinator, came in to the ward with gifts and comfort bears for each of her children. These bears were special, having a voice recording unit inside of them, so Renee could leave a message to each of her beloved children. 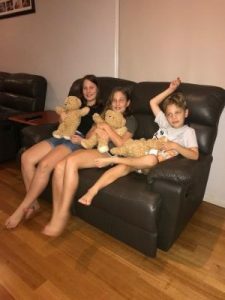 They were able to press the bear and hear mums voice while she was away in hospital. Mummy’s Wish also helped Renee access services and information to help her and her family, as well as provide groceries. Fast forward to 2017, and after bravely fighting cancer for nearly two years, Renee is living cancer free. Now volunteering for Mummy’s Wish, Renee wants nothing more than to ensure that other mums going through the same agony of a cancer diagnosis know they’re not alone; to help provide them with the support they need to ensure their family unit can continue on.